Forget drive-in movies, ‘cycle-in’ is where it’s at in 2011. 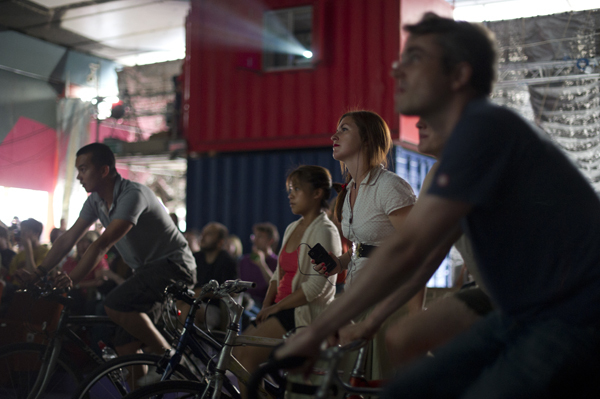 Magnificent Revolution’s Cycle-in Cinema combines the moviegoing experience with exercise and green credentials. You rock up on your bike, hook it up to the on-site generator and pedal away to power the projector and watch the film. There’s no need to worry about the sound of all that pedalling ruining the movie, audio can be transmitted to mobile phones and FM radios so you can get it straight into your headphones. The idea, as well as being a bit of fun, is designed to raise awareness of energy consumption, and cyclists can see how much electricity they’re generating. Pop-up Cycle-in Cinema events are planned across the UK through the rest of 2011 and into 2012, and anyone interested in hosting an event can get in touch with Magnificent Revolution.